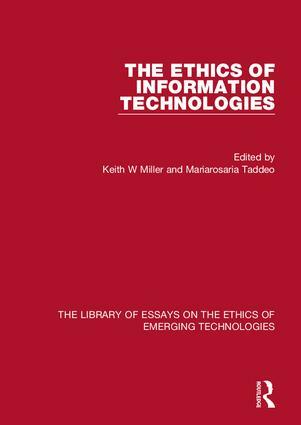 This volume collects key influential papers that have animated the debate about information computer ethics over the past three decades, covering issues such as privacy, online trust, anonymity, values sensitive design, machine ethics, professional conduct and moral responsibility of software developers. These previously published articles have set the tone of the discussion and bringing them together here in one volume provides lecturers and students with a one-stop resource with which to navigate the debate. 1. Moor, James H., (1985) "What is Computer Ethics? ", Metaphilosophy 16.4: 266- 275. 2. Bynum, Terrell Ward, and Simon Rogerson. "Introduction and overview: Global information ethics." Science and engineering ethics 2.2 (1996): 131-136. 3. Tavani, Herman T., (2001) "The State of Computer Ethics as a Philosophical Field of Inquiry: Some Contemporary Perspectives, Future Projections, and Current Resources", Ethics and Information Technology 3.2: 97-108. 4. Bynum, Terrell W., (2010), "Historical Roots of Information Ethics", in Floridi, Luciano, Handbook of Information and Computer Ethics, Cambridge University Press, pp. 20–38. 5. Floridi, Luciano, (2013) "Distributed Morality in an Information Society" Science and engineering ethics 19.3: 727-743. 6. Johnson, Deborah, (2006) "Computer Systems: Moral Entities but not Moral Agents" Ethics and Information Technology 8.4: 195-204. 7. Allen, Colin, Wallach W., Smith I., (2006) "Why Machine Ethics?" Intelligent Systems IEEE 21.4: 12-17. 8. Anderson, Michael, Leigh Anderson, Susan, (2007) "Machine Ethics: Creating an Ethical Intelligent Agent", AI Magazine 28.4: 15-26. 9. Grodzinsky, Frances S., Keith W. Miller, Marty J. Wolf., (2008) "The ethics of designing artificial agents." Ethics and Information Technology 10.2-3: 115-121. 10. Koscher, K.; Czeskis, A; Roesner, F.; Patel, S.; Kohno, T.; Checkoway, S.; McCoy, D.; Kantor, B.; Anderson, D.; Shacham, H.; Savage, S., "Experimental Security Analysis of a Modern Automobile," Security and Privacy (SP), 2010 IEEE Symposium on , vol., no., pp.447,462, 16-19 May 2010. 12. Nissenbaum, Helen, 1998 "Protecting privacy in an information age: The problem of privacy in public" Law and Philosophy 17.5: 559-596. 13. Tavani, Herman T., Frances S. Grodzinsky, (2002) "Cyberstalking, personal privacy, and moral responsibility." Ethics and Information Technology 4.2: 123-132. 14. Yao-Huai, Lü, (2005) "Privacy and data privacy issues in contemporary China." Ethics and Information Technology 7.1: 7-15. 15. Van den Hoven, Jeroen, Pieter E. Vermaas, (2007) "Nano-technology and privacy: on continuous surveillance outside the panopticon." Journal of Medicine and Philosophy 32.3: 283-297. 16. Murata, Kiyoshi, and Yohko Orito. "Rethinking the concept of the right to information privacy: a Japanese perspective." Journal of Information, Communication and Ethics in Society 6.3 (2008): 233-245. 17. Zimmer, Michael, (2010) "‘But the data is already public’: on the ethics of research in Facebook." Ethics and information technology 12.4: 313-325. 18. Serracino-Inglott, Philip, (2013) "Is it OK to be an Anonymous?" Ethics & Global Politics 6.4: 217-244. 19. Weckert, John, (2002) "Lilliputian computer ethics" Metaphilosophy 33.3: 366-375. 20. Reynolds, C. and Picard, R. (2004). Ethical Evaluation of Displays that Adapt to Affect. CyberPsychology and Behavior, 7.6: 662 – 666. 21. Friedman, Batya, Peter H. Kahn Jr, and Alan Borning, (2006) "Value sensitive design and information systems." Human-computer interaction in management information systems: Foundations 5: 348-372. 22. Turilli, Matteo (2007) "Ethical protocols design" Ethics and Information Technology 9.1:49-62. 23. van der Hoven, J. and Manders-Huits, N. (2009) Value-Sensitive Design, in A Companion to the Philosophy of Technology, eds J. K. B. Olsen, S. A. Pedersen and V. F. Hendricks, Wiley-Blackwell, Oxford, UK, 477-480. 24. Gotterbarn, Donald. "The use and abuse of computer ethics." Journal of Systems and Software　17.1 (1992): 75-80. 25. Anderson, Ronald E., Deborah G. Johnson, Donald Gotterbarn, Judith Perrolle, (1993) "Using the new ACM code of ethics in decision making." Communications of the ACM 36, 2: 98-107. 26. Nissenbaum, Helen, (1994), "Computing and Accountability", Communications of the ACM January 1994: 72-80. 27. Collins, W. R., Miller, K. W., Spielman, B. J., & Wherry, P. (1994), "How good is good enough? : an ethical analysis of software construction and use" Communications of the ACM, 37.1: 81-91. 28. Martin, C. Dianne, and Elaine Yale Weltz, (1999) "From awareness to action: Integrating ethics and social responsibility into the computer science curriculum." ACM SIGCAS Computers and Society 29.2: 6-14. 29. Trauth, Eileen M., (2002) "Odd girl out: an individual differences perspective on women in the IT profession" Information Technology & People 15.2 : 98-118. 30. Brey, Philip, (1999) "The ethics of representation and action in virtual reality." Ethics and Information Technology 1.1: 5-14. 31. Ess, Charles, and Fay Sudweeks. "Culture and Computer‐Mediated Communication: Toward New Understandings." Journal of Computer‐Mediated Communication 11.1 (2005): 179-191. 32. Sicart, Miguel, (2005) "Game, player, ethics: A virtue ethics approach to computer games." International Review of Information Ethics 4.12: 13-18. 33. Himma, Kenneth Einar. "The concept of information overload: A preliminary step in understanding the nature of a harmful information-related condition." Ethics and Information Technology 9.4 (2007): 259-272. 34. Vallor, Shannon, (2010) "Social networking technology and the virtues." Ethics and Information Technology 12.2: 157-170. 35. Taddeo, Mariarosaria, (2012) "Information Warfare: A Philosophical Perspective" Philosophy and Technology 25 (1):105-120.